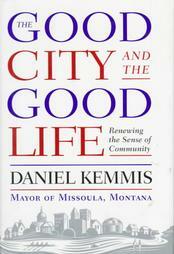 Daniel Kemmis is the author of Community and the Politics of Place. He is a former mayor of Missoula, Montana and minority leader and speaker of the Montana House of Representatives. He currently consults with communities interested in engaging citizens in participatory and beneficial change. Terril Shorb: One of the things I love about your book is that you weave civic engagement to the often separate considerations of the health of the natural world. Can you share with us some of the original experience that led you to that insight? Daniel Kemmis: Well, of course I grew up on a farm, so I had a very direct relationship with the natural world as a youngster. You can’t live in the Rocky Mountain West, as I have throughout my adult life, without being struck by and in some sense claimed by the wonders of these surroundings. But even here in the heart of the city, with the river running through it, with the city revitalizing itself by reclaiming its relationship to the river, I’ve had endless opportunities to remember how basic to our human being is our relationship to the natural world. Terril Shorb: Whether it is to strenghten natural or social connections, or both, how might we encourage local citizens to participate in beneficial change at home? Daniel Kemmis: Part of the challenge is to remind people that we do that so often at the local scale. We do it in small ways but when a city reclaims its downtown or re-orients itself to a river the way that Boise, Idaho has done, or comes together to protect open space, those are important examples of people identifying a common good and acting on it and putting their resources into it. Part of what troubles me is that we so often tend to measure the health of our civic or political culture according to how well we do at larger scales and therefore we overlook what we’ve accomplished at smaller scales. Terril Shorb: And within higher education, what helps students to get that more inclusive picture of sustaining our communities? Daniel Kemmis: Whenever there’s an opportunity to either offer interdisciplinary courses or degrees, there also are opportunities with the whole service learning field for teachers to be engaging with students with specific involvement. There should be an opportunity (also) to take a look at what students have experienced in the field and not just to do that discipline by discipline, but try to bring more of a cross disciplinary focus to bear. Terril Shorb: Was there a connection between the city of Missoula and higher education students? Daniel Kemmis: I often had interns in my office that was a good experience; many of those people have remained friends of mine ever since…a good thing going both ways. Terril Shorb: If you create a curriculum to grow interest in student’s participation in civic affairs, what would be some dream courses or elements? Daniel Kemmis: One very valuable experience is if you can get practicing politicians (current or who have been) into the classroom and give students a chance to be in dialogue with them and learn from them. I did some of that while I was in office. I always hear from students about how valuable that is to them, that on-the-ground experience. Terril Shorb: In our current political scene there seem to be absolutists on the one hand and those, on the other, who think the constitution is a living document. Would you see value in a course that looks at all this? Daniel Kemmis: I would put that in the context of the value of liberal arts education in general, but especially one that includes a substantial emphasis on history. It’s hard for me to see how anyone can be educated without any notion of what has gone before. I have tried to make the case that well educated young citizens should know something about politics, about how political systems work and decisions get made. I’ve been a little puzzled by the fact that colleges require ethics courses but none of them require politics courses and I think Aristotle would have been amazed by that (because) you could not have a fully rounded human being by teaching ethics but not politics. Students need training in constitutional history and jurisprudence, so that they have some fundamental notion of what are big issues like what form of interpretation makes sense in regards to a constitution. Just as an individual maintains his or her identity over time, while still changing and adapting to new circumstances, so does a body politic, and so must any covenant by which that body has constituted itself. To my mind, it is fruitless to try to pin down forever and unchangeably any living concept within a constitution. That doesn’t mean that new interpretations should be lightly introduced, but to deny the capacity of a constitution to reflect new realities seems like condemning it to death. Terril Shorb: There is a contemporary trend in the United states toward political polarization—the red-state, blue-state phenomenon. Can you speak first to what you think is behind this, and then, secondly, what it will take to move the populace toward unification? Daniel Kemmis: I think it’s become more and more difficult for us to find significant undertakings that can unite us at the national scale. Unfortunately, one of the surest ways of stirring a broad sense of national purpose is to launch an occasional military adventure. But that sense of unity soon wears thin, and then, lacking a more sustained sense of common purpose, it’s easy to fall into a sense of unity with our own ideological “tribe.” One reason I continue to put more emphasis on trying to build a sense of community at smaller scales is because I think people can actually work together there in pursuit of objectives they can see, feel, inhabit. That real, on-the-ground work reduces the tendency to fall back on ideologies, which can only divide us. Terril Shorb: Now that you have identified some of the aspects of a “more perfect union” as the framers of the Constitution wrote, can you speak to what you see as a role for higher education in helping to advance that? Daniel Kemmis: To the extent that higher education (or any education) deepens our understanding of our origins, our histories, our traditions, it gets us down to the bedrock from which we can build a shared and treasured world. To the extent that higher education segments knowledge, separating the humanities from the sciences, for example, it has the opposite effect. Terril Shorb: Regarding politics of place, I like that you have stressed the importance of place as a way to approach not only divisiveness about issues related to the natural world, but also to impart a sense of unity and shared value. Daniel Kemmis: One of the ways that some communities can do that is to focus on a particular feature of the community. In our case, and that of many others, the river is such an obvious commonly held and commonly appreciated part of the city. Most cities are where they are because of some kind of geographical or topographical feature that brought people there in the first place. So rather than just focusing on city environment in general, if it is possible, start with something that really does have a commanding presence in the community and spend some time talking together about what that feature mean does to the community. It eventually comes down to ‘build these trails or not’ or demand that these ‘buildings are set back from the river or not’ but still you are working with that commanding physical feature. Terril Shorb: How did that go in Missoula? Was it the instigation of the mayor’s office or citizens expressing a need or both? Daniel Kemmis: I recall both kinds of dynamics. There were times when I felt I was in a good position to get people to come together, it’s an advantage of the office to do that. People are going to be responsive at least once. I would use that convening power. But there were also instances where citizens would get together on their own and come to the mayor’s office, such as when the city and county were having a hard time working together on growth management issues and some broad diverse array of citizens got together (and said) ‘we’ve got to change this.’ They talked to the mayor and the county commissioners and said we want you to work together—and it worked! Terril Shorb: Much of what affects most of us happens locally, right in city council chambers. Daniel Kemmis: It’s a constant chore to keep people believing in their democratic capabilities; trying to encourage people to remember what they have already done well together and to think about what makes that happen. I was in Colorado Springs a couple of months ago, talking to leadership, to professionals, and at one point I asked them to name the two or three things they were most proud of the last ten years. At first, they said, ‘well, there isn’t anything’ and then they named one or two and then it started cascading. I also get the sense that there would be an art to helping people remember what they had done and what made that work and what might we want to do next. I don’t think these things happen automatically. Terril Shorb: In this era of diminishing government resources, what about sharing public and private resources? Daniel Kemmis: You hear more references to governance to government and part of the reason is there is a growing recognition that the pursuit of the common good (is something) we do on many levels simultaneously–non profits and volunteers are working right alongside of government. And government employees (are engaged) in pursuing the common good. So the challenge is trying to get deeper into that dynamic and get it better understood that is how things are likely to be. I’ve been involved in past few years in philanthropic work through serving on boards of foundations. I see increasing interest in foundations in figuring out how to work more effectively with governments and to identify and pursue the common good. It’s tricky because there are some people in government who just want to pass off what we think if as government responsibilities onto the private sector. But building stronger working relationships is part of what we have the opportunity to do. Terril Shorb: I hear a lot of talk about rights. What I don’t hear about the other R word responsibility. What about citizens assuming more of the responsibility for securing our own domestic tranquility. Daniel Kemmis: One aspects of the value of approaching civic responsibility is to invite people in ways they find enjoyable. One of the features of community life we sell short or overlook is the importance of celebration. A community, when it has done something well, really (needs to) pat itself on the back and have a good time over it. That matters because if people are going to be invited to a more active citizenship, a lot of that is not going to be going to meetings. a lot of times what people can do best is to contribute to (local) activities, many of which may be fun, may be recreational. Being alert to the multiplicity of ways people can contribute and then being clear that they are the ones who make it happen (reminds us) to celebrate each other and the community. Daniel Kemmis: Here again, we see this all around us. I see it here in Missoula, where we’ve remembered that this city is here because of the river, and now we’ve removed a dam, built parks and trails all along the river, and found a renewed sense of community in the process. Scores of other cities have done the same. Why do people love their rivers so? I think it’s because we want to be reminded that we’re not completely in control, or that we’re better when we share the work of creation with something wonderful beyond ourselves. Terril Shorb: Are you the kind of person who sees the glass is half full and if so, what is in it? Daniel Kemmis: I sometimes describe myself as a congenital optimist so I just have never gotten very much motivation out of paying attention to the darker side of things. That is not a value judgment. I have learned there is the shadow side and denying it is not in itself a healthy thing to do. But I have found that I get more motivated by paying attention to what has been accomplished and what there still might be to be accomplished. One of the things that is really enlivening me these days is how many young people (college age and older) who talk how much they enjoy this (Missoula) community. There are many communities where I think that potential exists to really pay attention to how we can make the community attractive for young people. Ask them–why is it attractive? What’s behind that? You get to a stage in life when only so many years of contribution are left. What would really get me down is to think there are no young people coming along who are capable of being engaged by the idea of community, being excited about it, wanting to contribute. There are a lot of good signs on that front.